William Edward Ayrton (1847–1908), electrical engineer and physicist. 1866–7 assisted teaching experimental physics and mechanics. Developed interest in the Indian telegraph service to such an extent that, despite only achieving a second-class honours degree, he excelled in the Indian civil service's entrance examinations. 1867–8 The secretary of state for India rewarded him by financing a year's study of electrical theory and laboratory technique with Sir William Thomson at the University of Glasgow. In the second service examination, Ayrton won a scholarship for study in Europe - gained practical experience of Post Office telegraph operations under William Henry Preece at Southampton, and also at the Telegraph Construction and Maintenance Co works in London. 1868 Joined the Indian telegraph service as fourth grade assistant superintendent. Ayrton worked with the electrical superintendent, C. Louis Schwendler, to develop a speedy method for locating faults in overland telegraph lines which were severely impeding colonial communications. This avoided the need lay an alternative coastal submarine cable around the subcontinent. Ayrton was rapidly promoted. 1871 Returned briefly to London to marry Matilda Chaplin, on 21 December. Returned to India without Matilda; Ayrton improved the telegraph network in the Bombay and Calcutta districts. 1872 elected a member of the Society of Telegraph Engineers. 1873 Assisted Sir William Thomson and Fleeming Jenkin in testing a new transatlantic cable for the Great Western Telegraph Co at Millwall and later at Mitcham. 1875 Collaboration with John Perry, professor of mechanical engineering at Tokyo. More than twenty papers were published by Ayrton and Perry from the Tokyo laboratory on a variety of subjects. 1878 He and his students opened Japan's first public electric lighting system at Tokyo's central telegraph station. 1878 returned to London in the autumn. Employed as an adviser to the telegraph company Latimer, Clark, and Muirhead. 1879 At the British Association meeting in Sheffield, Ayrton first proposed a.c. current transmission with transformers as the safest and most economical means of distributing electricity over long distances, the system now generally in use. 1879 became the City and Guilds professorship of physics (later electrical engineering) at Finsbury (later Finsbury Technical College). 1881 Developed the first "ammeters" and "voltmeters" and later dynamometers, wattmeters, dispersion photometers, and an ingenious ohmmeter for measuring resistance. Their clock-based domestic electricity meter was patented but they did not renew their patent, so losing opportunity for any royalties. 1882 Ayrton drove the first ever electric tricycle, using batteries made by the Fauré Accumulator Company to which he and Perry were consultant engineers in 1882–3. 1884 They invented the block contact switching system to prevent two electric trains from travelling on the same stretch of track; on the grounds of safety and economy they also successfully campaigned for the introduction of insulated returns on electric railways. Ayrton and Perry assisted at trials of Fleeming Jenkin's telpherage system of moving goods, later used in ski-lift (téléférique) systems round the world. 1890s Ayrton fought off plans to run an electric underground railway beneath Exhibition Road on several occasions, citing the electromagnetic threat to delicate laboratory researches. 1901 Awarded royal medal by the Royal Society in recognition of his contributions to research in physics and engineering. WILLIAM EDWARD AYRTON, born in 1847, died in London on the 8th November, 1908. The son of the late Mr. Edward Nugent Ayrton, barrister-at-law, he was educated at University College, London, and subsequently studied electrical science under Lord Kelvin. In 1868 he went out to India in the telegraph service, and 3 years later, at the age of 23, he became Superintendent of the telegraph system, which, during this period, was entirely remodelled. In 1873 he was appointed Professor of Physics and Telegraphy in the Imperial Engineering College at Tokyo, Japan, and whilst there he carried out, chiefly in collaboration with his colleague, Professor John Perry, a considerable amount of original research work, which was continued later in England, and was especially fruitful in the field of electrical measurement. Professor Ayrton took the chair of Applied Physics at Finsbury Technical College on its foundation in 1879, relinquishing it in 1884 to become Professor of Physics and Electrical Engineering at the Central Technical College, South Kensington, a post which he retained until his death. He was elected a Fellow of the Royal Society in 1881 and was awarded a Royal Medal in 1901. He was President of the Physical Society in 1890, of the Institution of Electrical Engineers in 1872, and of the Mathematical and Physical section of the British Association in 1898. He was a prolific contributor to scientific literature, and his valuable handbook on "Practical Electricity" has passed through many editions. He was twice married, and his second wife, formerly Miss Hertha Marks, has achieved independent distinction in scientific research. Professor Ayrton was elected an Associate Member of The Institution on the 4th February, 1879. WILLIAM EDWARD AYRTON, F.R.S., who died on November 8, 1908, at the age of 61, was the son of a well-known barrister, and was educated at University College, London, where in 1867 he obtained first place in the examination for the Indian Government Telegraph Service. After studying electrical engineering for a short time under the late Lord Kelvin, he went out to India to take up the post of assistant electrical superintendent of the Telegraph Department. In 1871 he was promoted to the position of superintendent, and in 1872 came over to England to assist in the manufacture of the Great Western telegraph cable, under Lord Kelvin and Professor Fleeming Jenkin. In 1873 he went to Tokio as Professor of Physics and Telegraphy at the Imperial College of Engineering, but in 1879 he returned to England and was for a time Professor of Applied Physics at Finsbury Technical College, and in 1884 was appointed Professor of Electrical Engineering at the Central College, Exhibition Road, which position he retained up to the time of his death. Much of his scientific work was done in collaboration with Professor Perry, who went out to Japan in 1875 as Professor of Engineering. Their joint investigations gave rise to many important discoveries in the theory of electrical science and its practical applications. They devoted special attention to electrical meters, many of which were brought out before the need for them had arisen, and they were awarded prizes at the Paris Exhibition of 1889 for the almost complete series they exhibited. They also acted as joint engineers to the Faure Accumulator Company, and carried out the electric lighting of the Grand Hotel, Charing Cross, in 1883. They designed a surface contact railway with automatic signalling, and (with Professor Fleeming Jenkin) a system of electric telpherage, and in these also they were rather ahead of the requirements of that period. 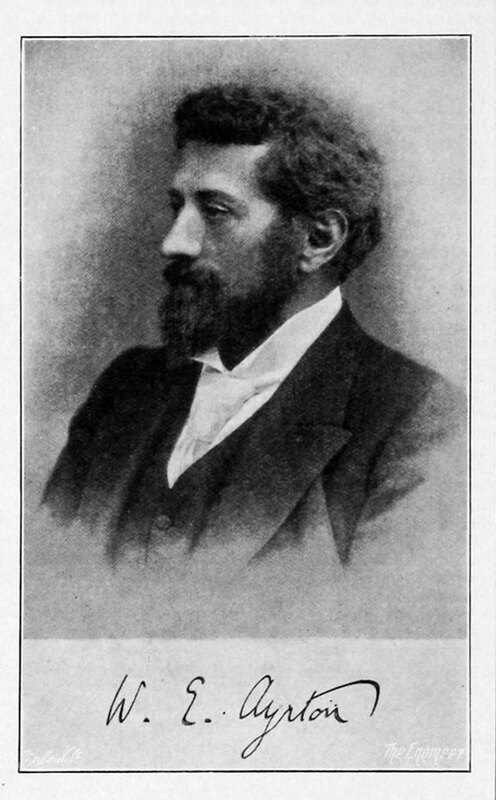 Professor Ayrton was a Fellow of the Royal Society, and the recipient of the Society's "Royal Medal" in 1901 for services to electrical science. He was President of the Mathematical and Physical Section of the British Association in 1888, and of the Physical Society in 1890. He was Honorary Treasurer of this institution from 1897 to 1902, and was President in 1892. He wrote many valuable contributions to the literature of the science, including an excellent treatise on "Practical Electricity," and his personal instruction has proved valuable to many of his pupils by inciting them to active research. He was gifted with impetuous energy, originality of thought, and great courage in the face of difficulties. He married in 1885 Hertha, daughter of Levi Marks, well known for her researches on the electric arc, and the only lady member of the Institution. This page was last edited on 7 November 2017, at 11:31.